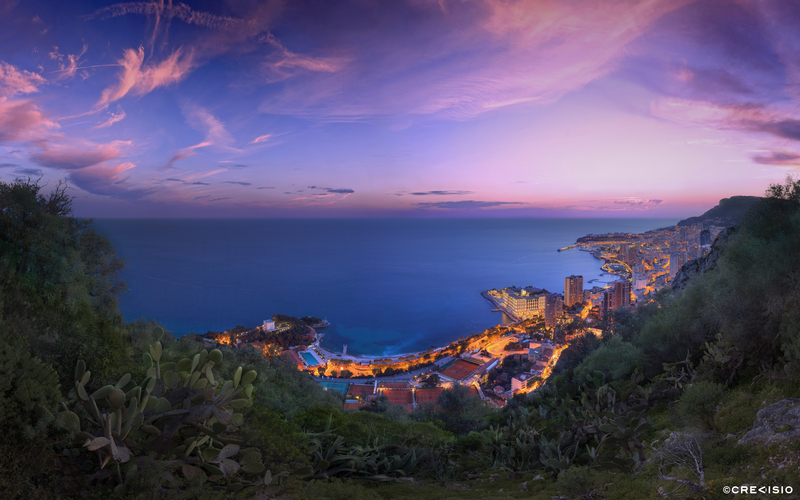 A winter sunset clouds panorama over the Principality of Monaco, taken in February 2015. This 433 megapixel ultra high resolution photograph (full resolution of 24,640 x 17,580 px at 300 dpi) is a 180 degree panorama taken from a cliff above Monaco. Beautiful pink and purple clouds appear mostly during the sunsets of autumn, winter and early spring, when the sun sets far out West, and thus lighting up the sky in fabulous colours. You may download a free high resolution version of this photograph for personal use by clicking on the image or on the link attached. For commercial use please contact Crevisio.